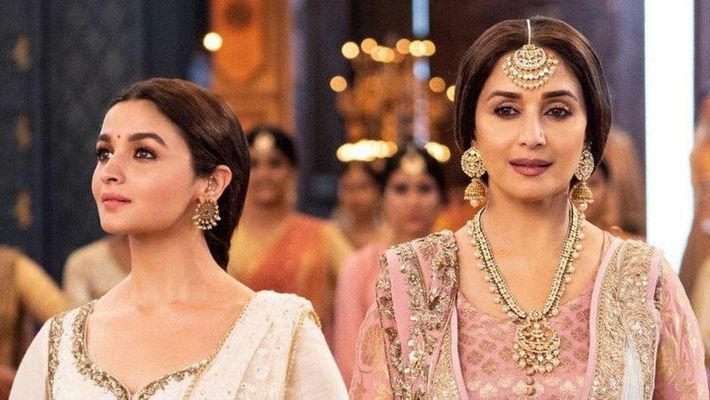 Kalank’s first song Ghar More Pardesiya is out and netizens are obsessed with Alia Bhatt and Madhuri Dixit, who wow us with their moves. There’s Varun Dhawan too. But the real stars of the song are the singers. Mumbai: The new song titled Ghar More Pardesiya from Kalank is finally released and features Alia Bhatt, Madhuri Dixit and Varun Dhawan. In the video, Alia can be seen performing gorgeous Kathak moves with Bollywood's dancing queen Madhuri. 'Dola re' nostalgia, anyone? The video of the song is shot in a grand set, with a lot of colours to overwhelm our senses. We can see Varun Dhawan's character Zafar, dressed in a grey dhoti and red kurta. Alia's character Roop is dressed in a white lehenga and Madhuri dons a peach-coloured lehenga with ethnic jewellery. The main attraction of the video is it is Alia-Madhuri’s jugalbandi and dance. Pritam has composed music for Ghar More Pardesiya that has been written by Amitabh Bhattacharya. Shreya Ghosal and Vaishali Mhade have lent their voices for the song and trust us, they have overshadowed the lead actors with the vocals. Earlier on Sunday, Alia teased fans with a teaser from the song and revealed that shooting for the song gave her sleepless nights. “A song that gave me sleepless nights, days & months is coming very very soon.. I think you can safely say that I have never been SO nervous for anything in my life.. *screams frantically and hides under bed* You may have to send a search party to find me. Meanwhile, watch this space for more..,” she wrote on her Instagram handle along with a picture from the song. Kalank stars Varun Dhawan, Alia Bhatt, Sonakshi Sinha, Aditya Roy Kapur, Sanjay and Madhuri Dixit in pivotal roles. The movie sees Varun play a blacksmith while Alia portrays the enchanting Roop, Sonakshi plays an innocent Satya while Aditya plays Dev, Sanjay plays a man of few words Balraj. Madhuri is the beautiful courtesan Bahaar. The movie has been directed by Abhishek Varman and has been co-produced by Dharma Productions, Fox Star Studios, Nadiadwala and Grandsons. The movie is a period drama set in 1940s India. Self-admittedly, Kalank was Karan’s father Yash Johar’s dream project. The movie which was earlier scheduled to release on April 19, is now scheduled to release on April 17.